Editor’s note: Managing editor Chris Case raced Grinduro on September 29. This gravel coverage is sponsored by 3T, Mavic, Bell, and Roka. Chris rode a 3T Exploro on Mavic’s Allroad Pro UST Disc wheels and Yksion Allroad XL tires and was equipped with a Bell Z20 MIPS helmet and Roka GP-1 sunglasses. As my friend Alec and I rolled out of the third timed race segment of Grinduro and into the day’s lunch stop, amid the enormous pine trees and the scattered bespoke bikes with their matching anodized headsets and disc brake calipers, we were greeted by Ms. Sasquatch. “Oh, poor Sasquatch hurt her finger?” She nodded. “How’d it happen?” we asked. She shrugged. “Did you drink a little too much and trip on a log last night?” There was an audible sigh from Sasquatch’s Chewbacca-like face, and her shoulders slumped in dismay. “Well, at least you didn’t break your wooly nose,” we exclaimed. She perked up, attempted an awkward knuckle bump, and walked off to greet other riders. What’s Grinduro, you ask? Well, that’s a great question, and one with countless answers. Essentially, Grinduro is whatever you want it to be. 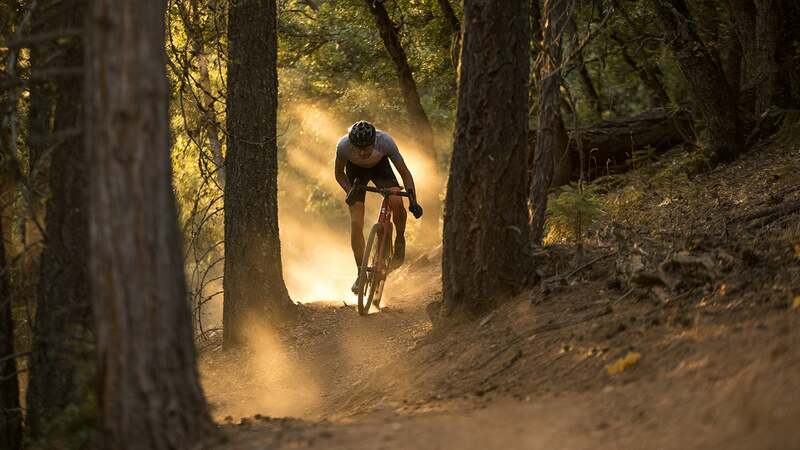 It is, quite simply, a choice of adventures by bike, wrapped in a camping trip, a concert, a party, a small frame-builders boutique, an art show, and a community gathering of cyclists in the Sierra Mountains of Northern California. Whew, did you get all that? Grinduro is one hell of a weekend. First, let’s unpack some of your choices on the bike. Is it a race? Sure. Smash yourself on four timed segments scattered over the 60-mile course, which has nearly 8,000 feet of climbing. There’s one short, steep dirt fire-road climb; one twisty, relatively wide descent on gravel; one rolling paved section of several miles; and, finally, the crux of the day, a rutted, bumpy, somewhat nasty singletrack descent. Add up your times; check the results; see just how well-rounded you are as a rider. This year, that award went to former WorldTour pro turned gravel crusher (or is it gravel-bagger?) Ted King. Other notable riders who have fared well in the past include Barry Wicks, Adam Craig, and Carl Decker. Meredith Miller made her fourth appearance at the race, alongside a host of other all-around fine riders, male and female. But not everyone is there to grind the gravel. Group ride? Indeed. If you want to simply take it all in, ogle some beautiful bikes — the number of machines made by small California builders is impressive, and hard to fully appreciate if you’re moving too fast — have a great ride, dance and binge at the food stops deep in the woods, belly flop at the swimming hole, meet some like-minded dirt fans, eat some dust, search for Sasquatch, stop and snap some Instagram fodder, you can do all of that. And get in some pedaling, of course. So, what’s it like out there in the Sierra Range? Grinduro is one of a growing breed of events for which there is no perfect bike. With an eclectic mix of terrain, you could ride one of a number of different setups. I saw plenty of mountain bikes, cyclocross bikes, gravel bikes, and everything in between. Some were old, some were new, some had flat bars, others had curly bars, or flared bars. I rode a bike capable of nearly anything, 3T’s Exploro, not only because it could handle the terrain, but because it can accommodate a wide, stout tire like the 40mm Mavic Yksion I had mounted. Whether I was in a paceline on the paved rollers or ripping down the singletrack descent, the bike and tires were as good a choice as I could imagine for the diversity of surface. Thankfully, though my lungs were subject to a bit of talcum powder, my eyes saw clearly through the haze. The combination of superior ventilation, an unobstructed field-of-view, and lower-rim protection on the Roka GP-1 sunglasses I wore perfectly handled the conditions of the day. Likewise, the warm California sun didn’t slow me down, in part because the ventilation provided by my Bell Z20 helmet made a big difference. Not so lucky was my drivetrain. Eventually, despite the prevalence of aid stations, complete with mechanical assistance and bottles of lube, the noise became downright shocking, especially in my easiest gear. The dust had turned chain and sprocket into an orchestra of toddlers high on sugar. I’ll try to spell it for you: SCREEEEEEEEEEEEE-KAKAKAKAKAKAKAKAKAKA-NNNNNNNNNNNNN-TIKTIKTIKTIKTIKTIKTIK. You get the idea. I couldn’t ride in the largest cog anymore; it was too embarrassing. I rode well ahead of Alec on climbs so my screeching transmission didn’t annoy him. I came across a giant pile of logs, as you do in the California forest. I climbed it, since I could, since I had the time, since this wasn’t one of the race segments. Eventually, Alec came around the corner, I snapped a photo, and then he yelled at me not to fall to my death because there was no way he was dragging my body all the way back to Quincy. I tiptoed down. Finally, we came to the most crucial part of the day: the singletrack descent. Everyone had heard about it; no one knew exactly what to expect. Would it be smooth and flowy? That’d be a no. I dropped in having given the riders in front of me a bit of breathing room. About 30 seconds later I realized I hadn’t given nearly enough breathing room. This was gnarly terrain, and some people just didn’t feel like pushing it. I typically abide by the 80 percent rule when on new terrain, far from home, out in the woods. Coming in hot from behind, I passed 10 or 12 other courteous riders who were all too happy to get out of the way of this crazy journalist on wheels. But they weren’t the only ones getting passed. Soon I could hear the distinct sounds of a genuine ripper behind me: that combination of chaos and speed, fast approaching. I quickly darted to the side of the trail, and a 14-year-old on a hardtail with a flat rear tire came shredding past. Ah, to be young again. This was the type of section that you would conclude, assuming you stayed upright and alive, with a sigh of relief. Ahhhh. By the time I reached the bottom, where riders had gathered to unclench their battered fingers and inspect their weeping kneecaps, the high school kid had his rear wheel off, and was laughing at the damage he had done to his alloy rim. Ah, to be young again. Alec and I rolled back toward Quincy when suddenly we came upon what might have been the most luxurious part of the day: affectionately dubbed the “redneck swimming hole,” the makeshift camp along a section of babbling river came complete with more Sasquatch, several beers to sample, rope swings, eight-person rafts, bright red beach towels, and a lot of conversation and camaraderie. What better way to end a great ride? This was the fourth edition of Grinduro in Quincy, California. There have also been two on the Isle of Arran, off the coast of Scotland. Excitingly, Grinduro will be expanding to additional locations in 2019. I hope to see you there. Grind on.